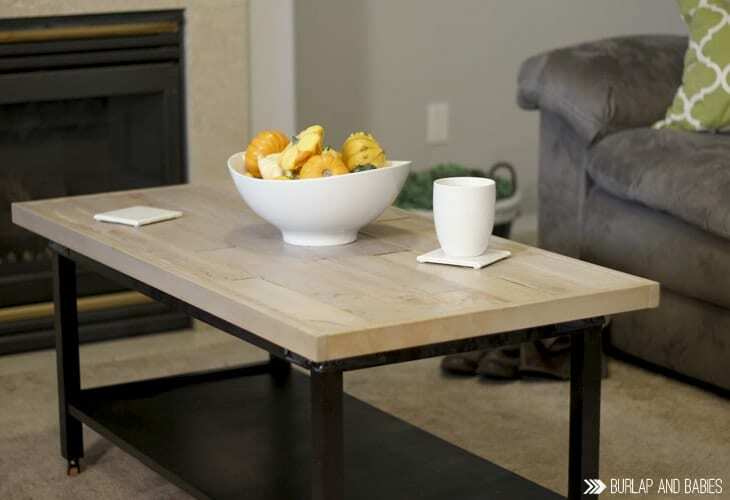 A World Market inspired coffee table makeover where farmhouse meets industrial. 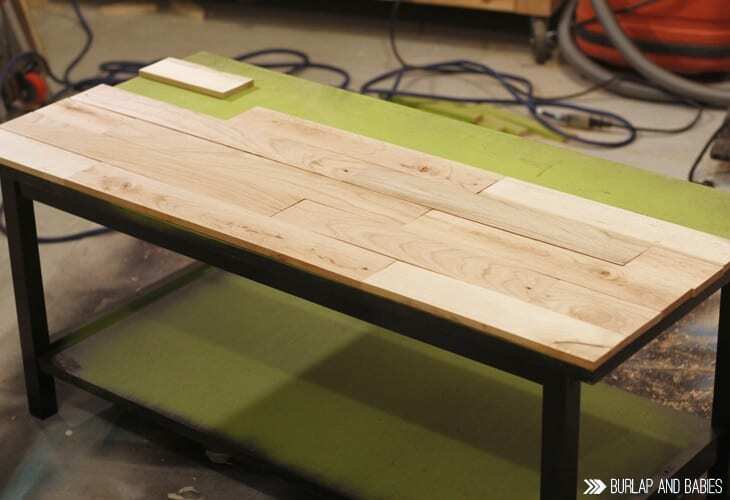 Use an old pallet, some paint, and stain to create a custom gorgeous coffee table to fit your style! A few years ago I bought a cheap $5 coffee table from Goodwill. On a whim a few months later I spray painted it green as part of our living room makeover. Fast forward a few years and more DIY experience and let’s just say I was not happy about that ugly green coffee table! The coffee table was a great size for our living room but just didn’t match our tastes. 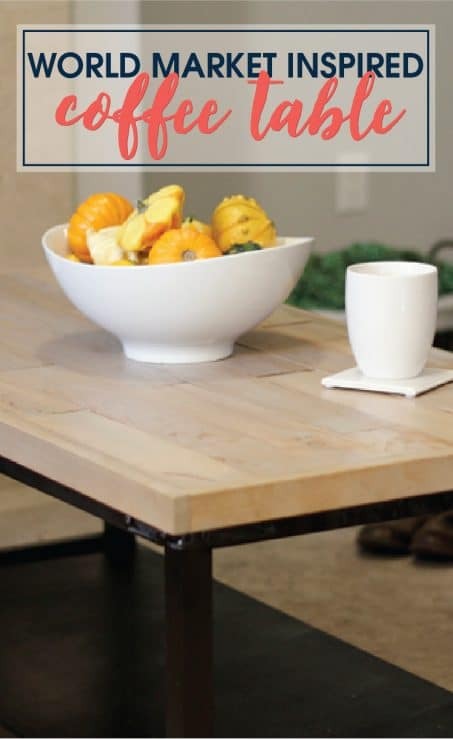 I found this stunning World Market coffee table and knew I could use it as my inspiration to create our very own coffee table makeover on a budget! 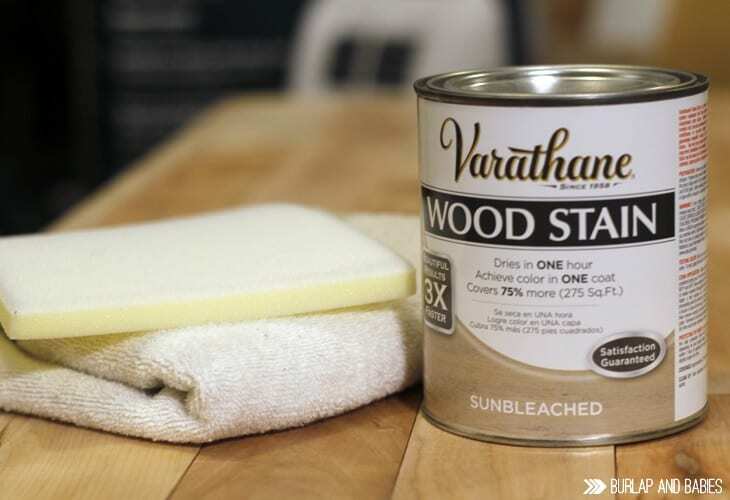 Check out this fabulous makeover plus 10+ other “Inspired By” furniture makeovers at the bottom of this post as part of a fun monthly party I’m doing called Furniture Refresh. I realize that everyone’s table is going to be somewhat different but here’s what I did to makeover my own table for this stunning coffee table makeover. The original coffee table cost me $5 from Goodwill. From there, these are the material and tools I used. I started by removing the side rails and prepping the table I currently had in our living room. Using 100 grit sandpaper and my random orbital sander, I roughed up the table and then spray painted the base with hammered black spray paint to give it an industrial look. 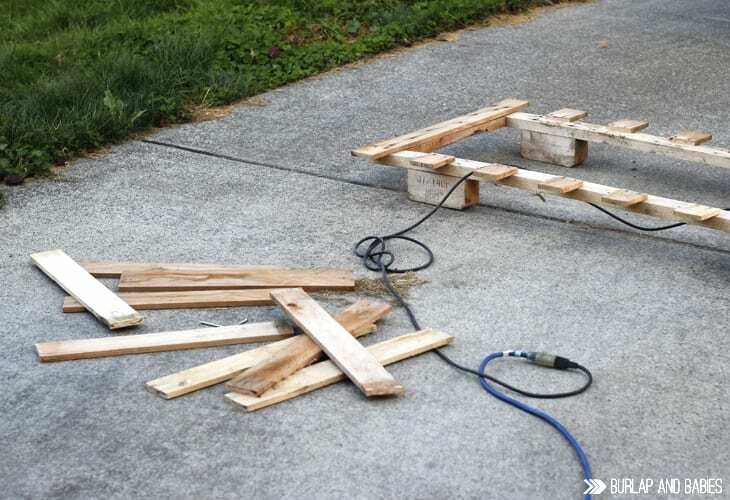 Next, I deconstructed my pallet. 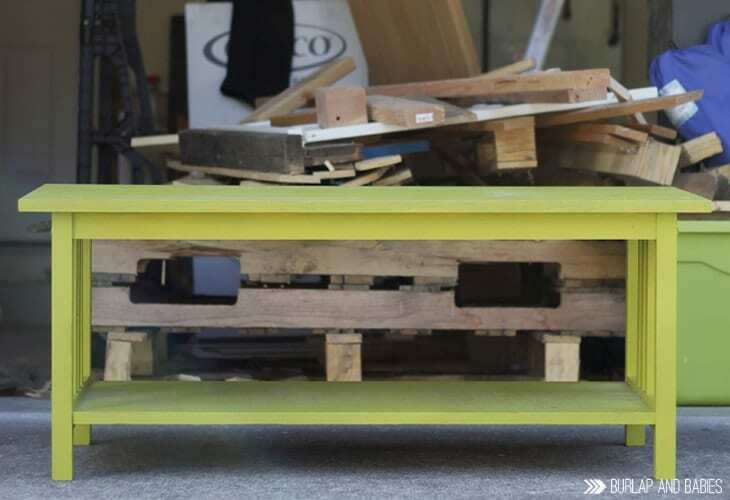 Depending on your pallet you can take them apart using a crowbar and hammer. 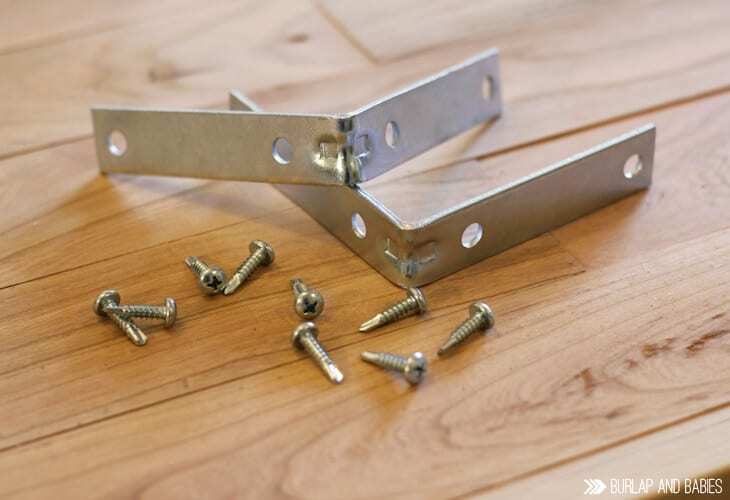 Mine was attached really well with long nails and kept breaking boards so I went the easy route and used my multimaster tool to cut them off. I lost about 6 inches of wood per board, however, I was losing that much, if not more, tearing apart so this was the best option. 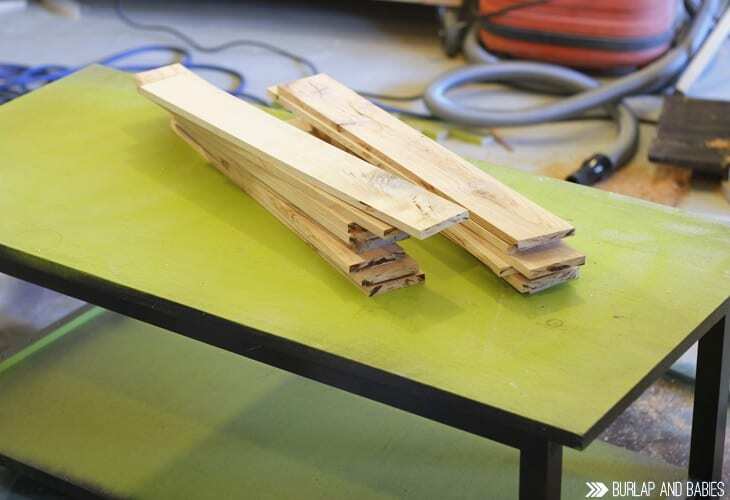 Once I had all the boards planed, I squared off the ends using a compound miter saw. Next, I decided how many board widths fit on top of the tabletop and figured out how wide each individual board needed to be. I then cut each board length wise on the table saw to get a straight edge. Once one edge was cut on all the boards, then I moved my table saw fence to the width that I needed each board and did another pass through the table saw. 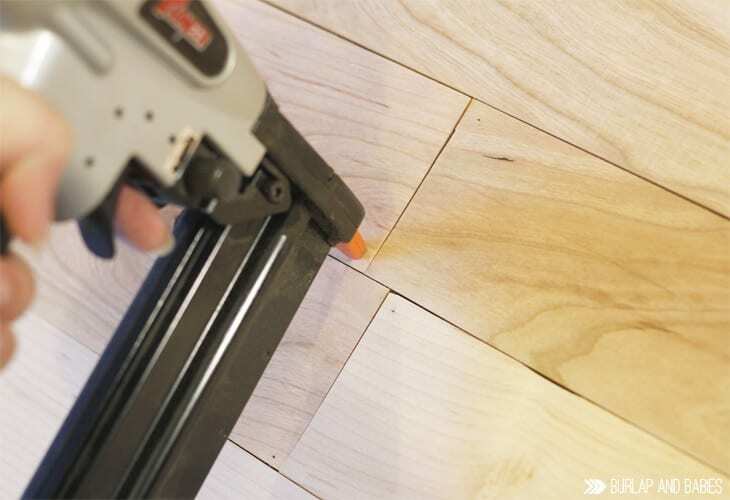 Now, time to start cutting to get the staggered hardwood floor type look. It took me days to get the courage to start the top look. 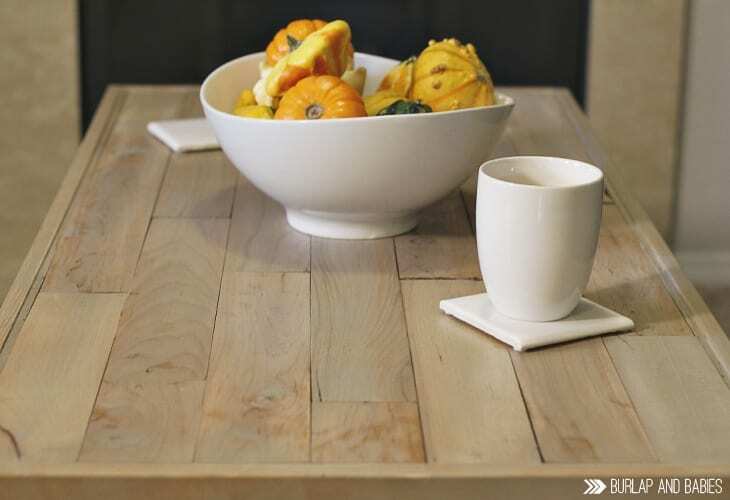 I loved the look of World Market’s tabletop wanted to nail the look. I promise you, it’s way easier than it seems. I tried drawing out plans of how I was going to cut them but the perfectionist in me lost and I ended up just going for it. Start with your first board and cut it at about 2/3. 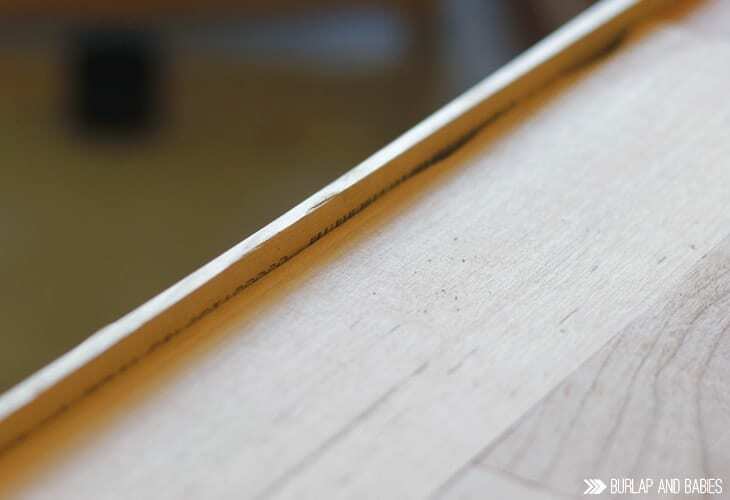 Lay those two boards down, being sure to flip one upside down and rotate it so the grain pattern doesn’t match up. Now, take your next board and lay it next to it. 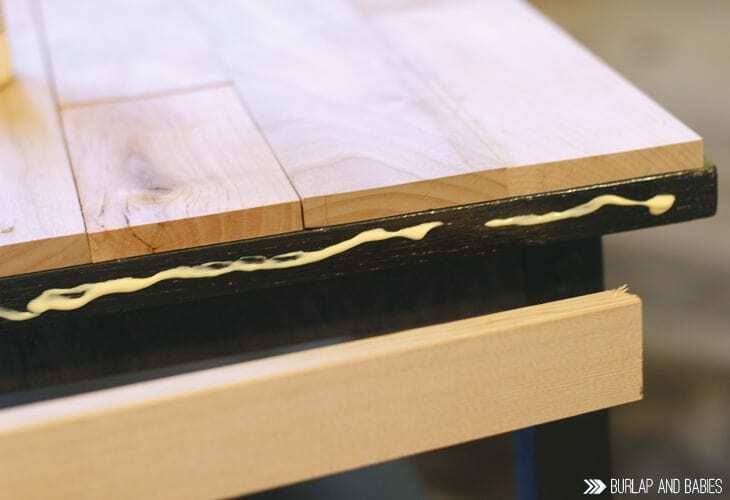 The pattern will vary depending on the size of your boards and size of your table, however, you’ll just go row by row and cut off the excess wood. You will then take that wood and use it to start your next row. It ends up going really fast once you get the hang of it. Be sure you square off all the edges before moving on to your next piece. If you follow me on Facebook, you probably saw a few days ago when I shared the unfortunate situation with my boards being short once I got to the end! Thankfully, I had an extra pallet board from a past project that I was able to use. That was fun! Besides that though, when pushed together, the boards were also about 1/4 inch too narrow. To fix that so that the edge 1×2 boards were flush, I got some thin 1/4 by 3/4 moulding to put on either side of the long edge. I planed it to the right thickness and width and then all my boards fit together like a perfect little puzzle like it was all meant to be. As you can tell, I am so not a professional when it comes to this stuff. No matter how many times I measure, things still end up a little off. It used to frustrate me so much, but now it just becomes a game to figure out how I can fix the building problem. 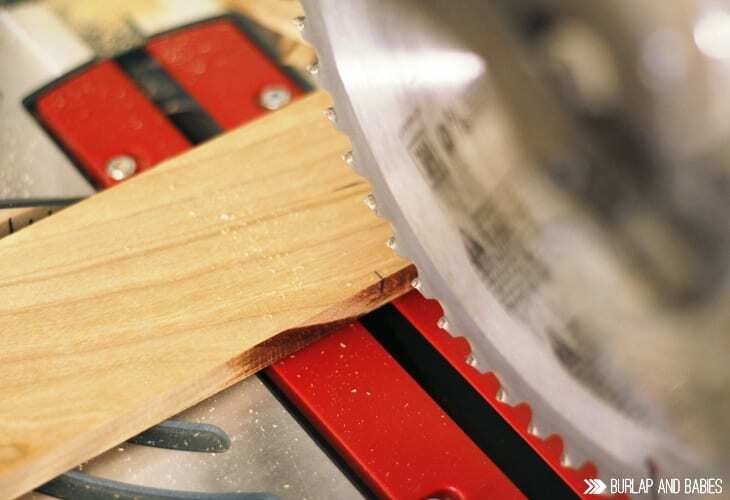 Although I love power tools, the preciseness of it all can be frustrating. Don’t let it hold you back though! Know that practice makes better. (Not perfect, but better.) There’s always room for improvement! After the boards were all put together I cut 1×2 wood to frame the whole tabletop. I used titebond II wood glue to attach the boards to the edge of the old tabletop and then I used the micropinner to hold it all together while the glue dried. Once the tabletop frame was attached I pinned the boards down to the old top to keep them all in place. I could have glued them all to avoid the pin holes, but you can barely see them and pinning it goes way faster. 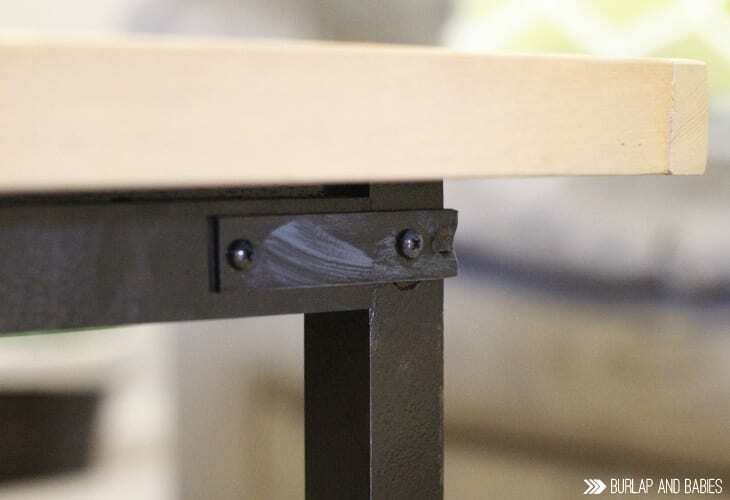 The legs stuck out on my table by 1/4-1/2 inch so I used thin moulding to make the edges flush below the tabletop. This made it so that I was able to attach the corner braces I found to give it a more industrial look. 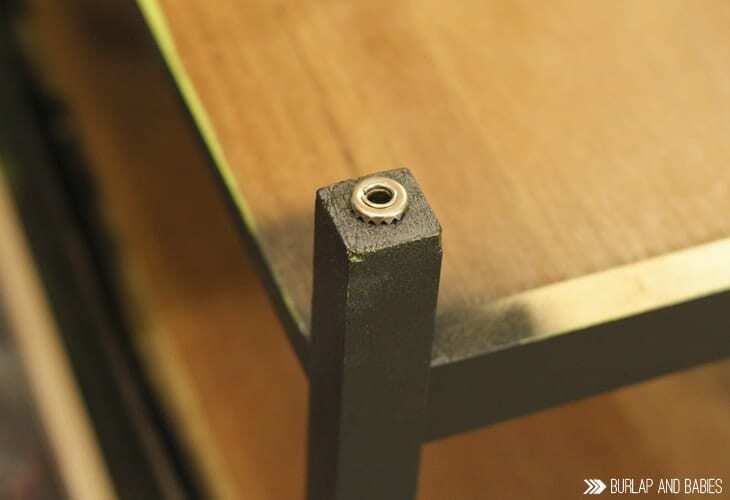 I also used these rounded screws and spray painted them black to match. Once it was all attached and black, I smeared some gray acylic paint on it to add some color and make it a little rustic. Next, came the wheels. I loved the rustic wheels on the World Market table. Unfortunately, I checked out local antique stores and couldn’t find any awesome, vintage ones. I did find these wood casters though that do the job. I drilled four holes in the legs, pounded in the caster sleeves, and popped the wheels on each leg. And finally the last step! The stain! This was the most stressful part of the whole makeover. I stained the tabletop with this sunbleached wood stain. I was hoping for a vintage farmhouse feel but it ended up looking like cheap watered down gray paint on my pretty table. I sanded it down a little bit and then added some english chestnut stain that I wiped off after about 15 seconds. The stain was leftover from our industrial light. It gave the tabletop a warm feeling. After letting it dry overnight, the table was complete! And for the pretty pictures! I love how this table turned out and I am excited that I got it complete on time to decorate for fall! What do you think? Do you love industrial meets farmhouse as much as me? I have teamed up with these fabulous other ladies to share with you a monthly themed furniture makeover. This month is INSPIRED BY. Check out all of these gorgeous makeovers! wow…I love this! What a great transformation!!! Such a great table and a great knockoff. It turned out beautiful! Such a great use of resources and talent! I love what you did with this table! 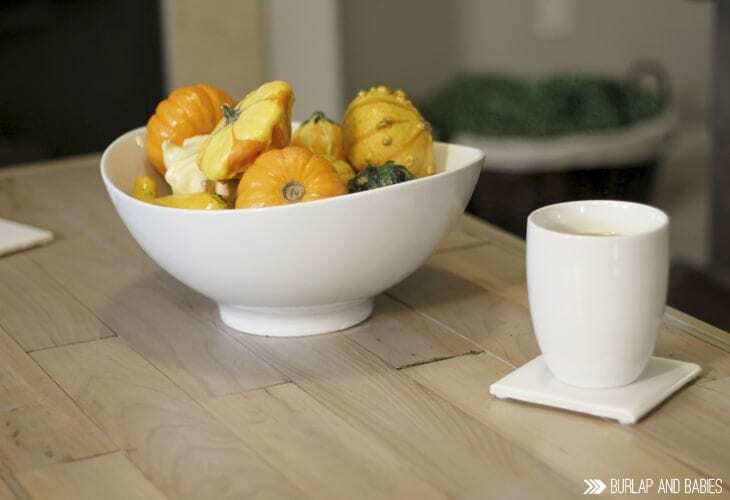 Such a big difference, a whole new style for the table. I LOVE it…. I love the look of rustic & industrial and this really turned out nice! Amanda, this is so stunning! You totally nailed the World Market feel! Oh yay! Turned out so good! Oh wow, this is like a brand new table! Seriously stunning transformation! I wish you a most wonderful week!